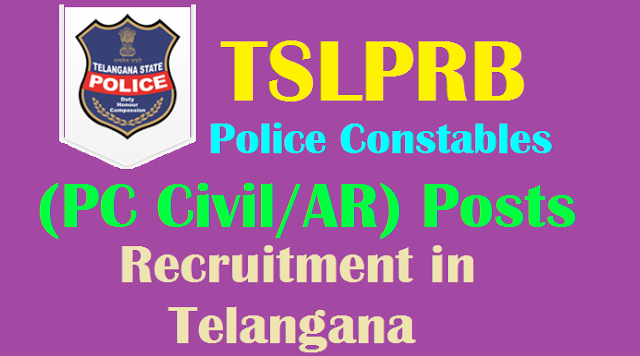 TSLPRB to fill 3897 Police Constable(PC) Posts 2017 in Telangana TSLPRB Recruitment of Constables in Telangana-Get Details GO MS No 156 Public Services – Home Department - Recruitment – Filling of (3897) Three Thousand Eight Hundred and Ninety Seven vacant posts in various categories under the control of Director General of Police, Telangana, Hyderabad, by Direct Recruitment through Telangana State Level Police Recruitment Board, Hyderabad – Orders – Issued. TSLPRB will give Police Constable Posts 2017 Recruitment notification and Online Applications would be invited through On-line mode only in the prescribed proforma to be made available on #TSLPRB webportal (www.tslprb.in ). TSLPRB Police Constable Posts 2017 Syllabus, Online Application Form, Eligibility Criteria, Qualifications, Registration Fee, How to Apply, Last date, Hall Tickets, Results/Selection List, Exam Pattern, Exam Date details are to be available on TSLPRB Web portal. G.O.Ms.No. 156 Dated: 30-10-2017 :: GOVERNMENT OF TELANGANA - FINANCE (HRM-VII) Read the following:- Ref: Home (Genl) Dept., U.O.No.2680(P)/Genl/A2/2017, dt:11.10.2017. DEPARTMENT - Public Services - Home Department - Recruitment - Filling of (3897) Three Thousand Eight Hundred and Ninety Seven vacant posts in various categories under the control of Director General of Police, Telangana, Hyderabad, by Direct Recruitment through Telangana State Level Police Recruitment Board, Hyderabad – Orders – Issued. a) A person, who as on date of notification, has been on duty as Home Guard for a minimum duration of 360 days within a period of two years and who is still continuing his service as Home Guard, must have attained the age of 18 years and must not have attained the age of 33 years as on 1st July, 2016 e., must have been born not earlier than 2nd July, 1983 and not later than 1st July, 1998.
b) In the case of all other candidates, must have attained the age of 18 years and must not have attained the age of 25 years as on 1st July, 2016 e., must have been born not earlier than 2nd July, 1991 and not later than 1st July, 1998. B. Minimum Educational Qualification: The candidate must hold, as on 1st July, 2015, Intermediate or its equivalent examination recognised by the State Govern In the case of a candidate belonging to Scheduled Castes or Scheduled Tribes, as on 1st July, 2015, he/she must have passed SSC or its equivalent examination recognised by the Telangana State Government and should have studied Intermediate and appeared for the Intermediate Examination in, both the 1st year and 2nd year. Selection Procedure/ Scheme: The Selection Procedure/ Scheme of the Exam will be as follows- Preliminary Written Test, Physical Measurements Test (PMT), Physical Efficiency Test (PET). ‘Telugu/Urdu’ version of the question paper also. 1. Age: Enhanced the upper age limit by (3) years for a period of one year from the date of issue of G.O. i.e., 21-12-2015 to the various categories of the posts to be notified by the TSLPRB. 2. In the revised recruitment rules, the following are the changes/modifications for direct recruitment for the posts of PCs. 1. 5 KM/ 2.5 KM run has been deleted for all posts. 2. In place of running test, there will be Preliminary Written Test with minimum Qualifying marks of 40% for OCs, 35% for BCs and 30% for SCs/STs/Ex-Servicemen. 3. There will be 33 1/3% for Women reservation in Civil Police, Communication and FPB and 10% reservation in AR in a horizontal reservation following principle of sufficiency. The vacancies which could not be filled for want of eligible women candidates, the same will not be carried forward and will be filled up with men candidates of the respective category. 4. Weight for women candidates in the Physical measurements has been removed. 5. The men candidates have to qualify 3 out of 5 events in Physical Efficiency Test for the post of PCs (Civil). 6. The women candidates have to clear 2 out of 3 events in Physical Efficiency Test for the posts of PC (Civil). 7. The men candidates have to compulsorily qualify in 800 meters run and for women candidates in 100 meters run compulsorily. 8. For Women candidates for the post of PC in AR they have to clear all (3) events and their final selection will be based on marks secured in the final written examination and PET events. 9. There will be weightage of maximum (6) marks for the post of PC (AR) in the final selection for those possessing HMV and LMV license. 10. For Scheduled Tribes and Aboriginal Tribes candidates in the Agency areas of Mahaboobnagar, Adilabad, Warangal and Khammam, in the existing rule they will get chance if candidates with sufficient number possessing the required prescribed height/chest are not available. By this, the above candidates are depriving their chance of selection. Hence, it is to consider with reduced height/chest prescribed for them on par with other candidates as per their common merit as furnished below. 12. To assess the emotional intelligence and sensitivity of the candidates to Gender issues, social issues and ethics and also to assess their aptitude for a strenuous job in policing, a new topic PERSONALITY TEST has been introduced in the final written examination but not in the preliminary written test. 13. There will be a subject of Telangana History for the post of PCs and SIs and equivalent posts in the written examination. The Registration fee is Rs. 400/- for the candidates belonging OCs/BCs and Rs. 200/- for the candidates of SCs/STs. The fee may be paid at TS Online / AP Online / Mee Seva (e- Seva) centers / through Payment Gateway (Credit card/Debit card/Internet Banking). The desirous and eligible Candidates may apply ON-LINE only by satisfying themselves with the terms and conditions of this recruitment. Detailed information regarding Syllabi, Procedure for Online Application, distribution of vacancies, selection procedure, instructions to the candidate etc., is given in the Detailed Notification displayed in the website www.tslprb.in.